Great tool for Bridge teachers and students. Is there a better alternative to Bridge Hand Composer? Is Bridge Hand Composer really the best app in Teaching Tools category? Will Bridge Hand Composer work good on macOS 10.13.4? Bridge Hand Composer aims at people that want to demonstrate the card game bridge. 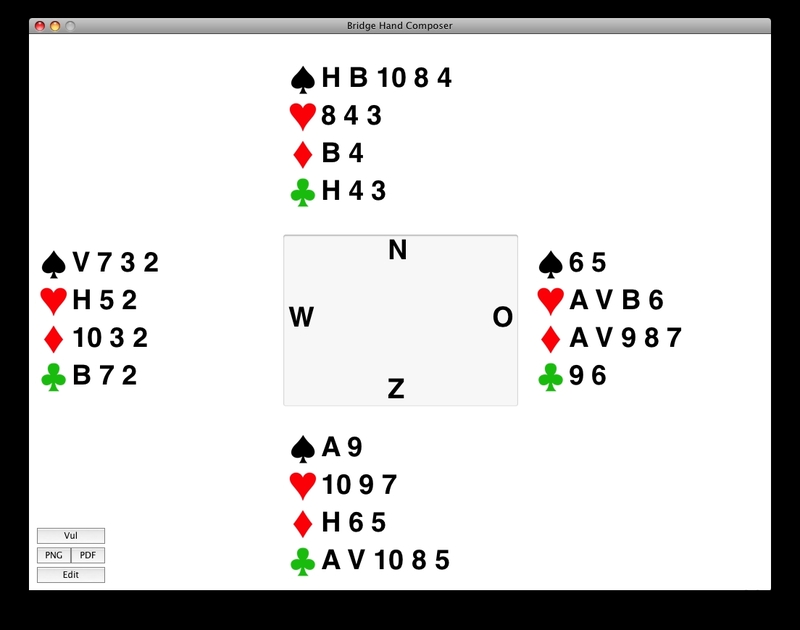 The program assists the teacher to compose hands or complete card distributions and to print those in a large font. Great Tool for Bridge teachers and students. It is easy to attach the output to a whiteboard by using magnets or magnetic tape. Bridge Hand Composer shortens the time the teacher needs to prepare for a presentation enormously. During his actual lessons he can go through many more examples as he no longer needs to write the hands down with an erasable marker. Bridge Hand Composer needs a review. Be the first to review this app and get the discussion started! Bridge Hand Composer needs a rating. Be the first to rate this app and get the discussion started!